I never copy another designers idea however .Thru a series of questions and our stylecanvas worksheet I usually can satiate their desire. In this case I suspected that this was an engineered novelty knit. As a child, I watched women pull tear-sheets and bring it to my mom to make for them. Usually the items were NOT available for them to purchase and if they were they were not available in the size. Not everyone has a figure like that of the Proenza Schouler Spring 2016 models or Lupita Nyong’o. I’d always to called on to decipher the dress. One can say that I started hacking early. 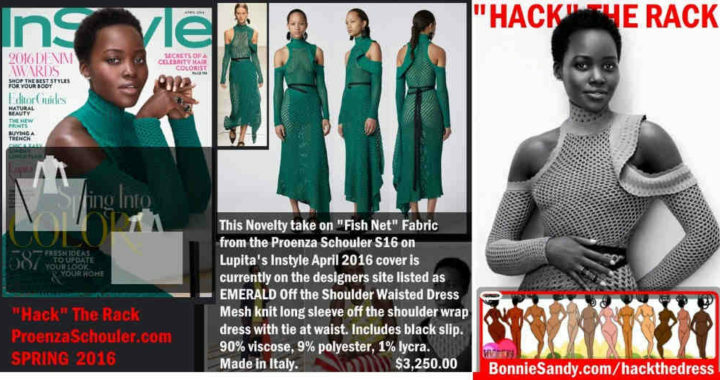 Essentially what we did as custom designers and dressmakers was make the product meet the consumers needs we were “Hacking the rack”, as they appeared in magazines and catalogs. Today tear sheets are social media and these queries are posted in groups and timelines. So what exactly does a hack entail and how do I host that online – well the customer is usually attracted to everything but at least one aspect. So the ask for a change in one or more of these. Color – Usually the call is to change the color of the item to say complement a shoe or handbag. Often it’s to create something in a particular color. In both cases it’s best to do a color analysis of client needs first. What looks great in a magazine shoot may not go across well at the office. Cut – This is where skill really comes in and sometimes in Custom design you literally will need to talk the client into a better choice for their body type. In a store, the buyer needs to keep abreast of body shifts in their consumer locales. Online at least to me, it’s about helping creating versions to meet different body types. 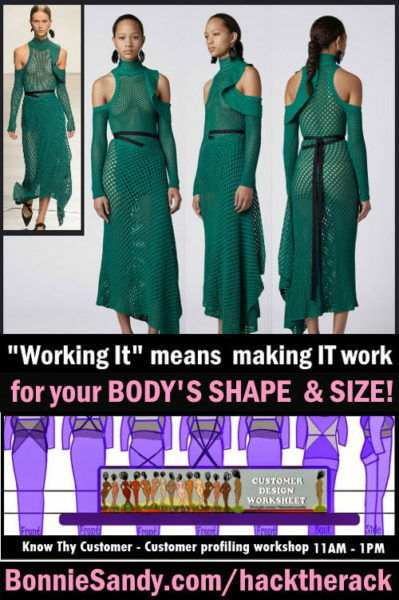 Fabrication – Let’s face it few women can carry off that see-thru look. so the question here is about achieving the “look”. The construction process – For makers it’s about getting a pattern to crochet or hand knit . For many it’s about changing an aspect- in this case it was the “wrap” portion. The question posed can this be done in a wider skirt, yes a wrap semi flare. Another can it be done in a crochet or knit… Yes to both but with someone who had exceptional skill! Mesh knit long sleeve off the shoulder wrap dress with tie at waist. Includes black slip. 90% viscose, 9% polyester, 1% lycra. Made in Italy. Posted in hacktherack, Rethinking Production.